The MICHELIN X TWEEL TURF is designed to virtually eliminate tire downtime. According to a recent company news release, John Deere and Michelin Tweel Technologies have announced the new “MICHELIN X TWEEL TURF,” an airless radial tire that aims to eliminate downtime for commercial John Deere ZTrak mower operators. The new tire technology is being sold exclusively for John Deere ZTrak 900 Series models with 54-, 60- and 72-inch deck sizes. The X TWEEL TURF has the same dimensions and bolt patterns as a standard 24x12x12 tire, featuring automotive rubber technology, allowing the tread to last up to three times longer than standard turf equipment tires. Jack Olney, commercial director for Michelin Tweel Technologies, said in the news release, "The MICHELIN X TWEEL TURF is the no maintenance, no downtime, no compromise solution – bolt it on and forget it. 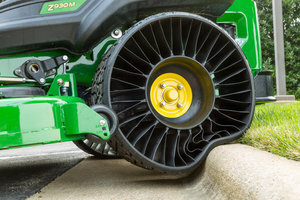 The TWEEL airless radial innovation coupled with John Deere's tradition of providing superior quality mowers sets a new standard for the landscape industry." Deere and Michelin Tweel Technologies unveiled the new technology at the 2014 Green Industry and Equipment Expo (GIE+EXPO), in Louisville, Kentucky. The GIE+EXPO is an annual gathering of lawn and landscape manufacturers, dealers, distributors and lawn & garden professionals. This is Deere’s second ZTrak-related product announcement in the past week. The company also recently announced the addition of the Z997R Diesel Ztrak Mower to the fleet, which will be available for purchase in spring 2015. Each of these product introductions and enhancements aim to minimize downtime, decrease costs, and improve the overall experience for Deere’s commercial mowing customers.